This may be the most important article you will ever watch. We hope not because for that to come true you would have to be involved in an active shooter incident while the likelihood of finding yourself in an active shooter incident is small, the risk is real and these situations are happening with increasing frequency on college campuses and elsewhere. Our objective is to help put you in control of the outcome. 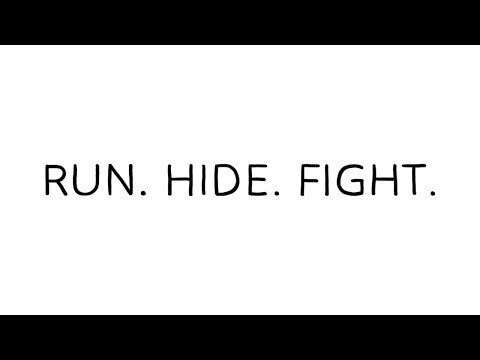 Everything we discuss in this article can be summed up in three words: RUN, HIDE, FIGHT!! But first what is an active shooter? An active shooter is someone with a gun attempting to kill people, and it can find populated area. For you, that means someone with a gun on campus who wants to kill. The purpose of this article is to give you the tools and confidence necessary to survive an active shooter attack. How will you know when an active shooter attack is underway? You know that gun shots don’t always sound like they do in movies. If it sounds like a gun or even firecrackers consider that it may be an attack. Do NOT wait for confirmation, do not seek a second opinion if it sounds like gunfire. The same goes for screaming. While screaming doesn’t always indicate danger it may be a reaction to something terrible. Keep in mind that police are minutes away not seconds you must fend for yourself during this time. You cannot wait for the police to arrive, you cannot wait to act if you are inside a building. Use any way out available including emergency doors and windows. Keep closed signs don’t matter now. All options are available to you. Always be aware of your surroundings, identify your options and make a plan. By the time an attack begins you should already know where to run. Look for exits now so you won’t have to during an attack. When the time comes to run, leave everything behind except your phone. Everything!! Just thinking about what to bring is time wasted. The most valuable thing you have is you! Grab yourself and go get yourself to a safe place! If you are outside run away from the attack zones. Don’t stop running until you are certain you are away from danger and in a safe area. When running try to make yourself a more difficult target. It might be slower but it could be safer. Don’t turn around to see what’s happening behind you. It is unlikely that the shooter is chasing you, but either way slowing down to look for the shooter is not a smart strategy. Once you are out of immediate danger dial 9-1-1! Tell the dispatcher there is an active shooter and your location. Do not assume someone else has already called 911. Yours could be the one call that saves lives. If you think it’s too risky to leave your current location, hide. Active shooters seek easy targets, so don’t be an easy target. It’s that simple an ideal hiding place would be a room with no windows and a locking door. But that option might not be available. When the time comes, turn off lights and shut the blinds. Make it look like the room is unoccupied. Even partial darkness helps. Choose cover over concealment whenever possible. Concealment is something like an office partition it will hide you from sight but it will not stop a bullet. Cover is something that will do both. Heavy wooden doors file cabinets full of paper and objects of this type should always be your first choice. If possible barricade doors behind you, even if locked. But try not to make unnecessary noise in the process. Be silent turn your phone to silent. Shooters don’t waste time exploring rooms that look unoccupied trying to break down locked doors or searching for hiding students. Once hidden, be prepared to stay hidden a long time. Stay calm and to be patient, it may take a while but the police will eventually find you and lead you away from danger. Again the time to look for places to hide is not after the shooting has begun, it is now! Wherever you are on campus, be aware of your surroundings and ask yourself, “Where could i hide if it happens?, what are my options, does this classroom have a closet, does the door lock, what could I use to barricade the door”. If no other option is available, defend yourself! You might not think of yourself as a fighter but others just like you have surprised themselves with how effective they can be when fighting back was the best option for survival. The attacker has at least one weapon and you do too. Look around for: chairs, textbooks, backpacks, rocks and pens. You have more options than you probably thought. One readily available weapon is a fire extinguisher and you will find them in nearly every hallway. You also have surprise on your side. The attacker is not expecting armed resistance until police arrive. This is your advantage. When you fight back, your goal is to overwhelm the attacker and minimize their ability to use weapons effectively. By limiting their vision or physically disabling them, you and others nearby can weaken the attacker. This will give others the confidence to join the fight. Lastly, when you fight back don’t stop to soon fight until the threat is over. The number-one job of the police is to stop the attack. This means they are totally focused on neutralizing the shooter. Keep in mind that active shooters look like anyone else, even students like you. So when you exit a building raise your hands to show the police that you aren’t holding any weapons you don’t want to be mistaken for the attacker. Remember just as you are afraid the police are on edge, they need to be ready to take immediate and decisive action so your behavior is critical. Hands in the air to avoid sudden movements and obey police direction. The police will shout orders, they don’t have time for courtesy. They must act quickly and forcefully! Do what they say for everyone’s benefit. Like we said the police are there to stop the attack. Once that job is done, they will turn to helping. Let’s talk about helping others. This may be the most difficult decision of your life, but the best thing that you can do may be just to run and get help. Remember most active shooter incidents begin unexpectedly and end quickly . Help is on the way if you can remember: RUN, HIDE, FIGHT !! You have the most important knowledge needed to survive an active shooter attack. Familiarize yourself with your environment, plan ahead and if you are prepared you will be able to run hide and fight without hesitation and with confidence! The active shooter threat is not limited to your school but to any public place.